These .002" thick 3/4" x 2" polyester labels are custom manufactured using a process in which your logos, type and bar codes are actually embedded and protected below the surface of the label. So, you can use these labels in most environments including those where caustics and solvents are used. You get high resolution and full range of standard color and design options. Permanent pressure-sensitive adhesive binds these labels to most surfaces. Tough aluminum labels that resist abrasion, solvents, high temperatures, the elements and even tampering. These versatile labels apply easily and conform to most surfaces, even curved or uneven surfaces. Bar codes and alphanumeric human-readable text are photographically reproduced on .003" anodized aluminum for maximum clarity and detail and a thin profile. 3/4" x 2" size. Payments for customized labels are non-refundable. Allow up to two weeks for delivery after approval of the printing proof. 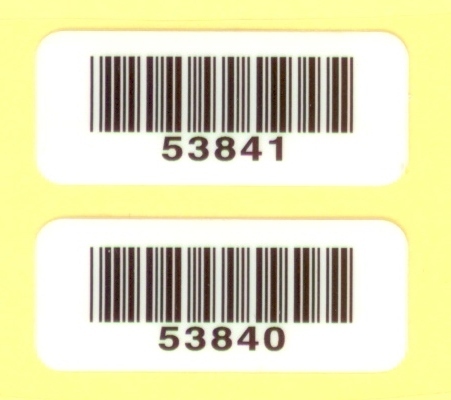 Premium Polyester Bar Code Labels: These polyester labels are the same as the ones described above except they are 1 1/4" x 1/2" and contain only the barcode and its human-readable number only. The numbering sequence cannot be guaranteed; however, these labels are ready for immediate shipment. Copyright © 2016 by Landmark Data Systems, Inc.